I wanted a bit more side wall so went with 40s and also HR spacers. Happy with the silver peelers with all seasons (pirelli scorps) and keeping the blk peelers that came with the truck with the summer perf fires for possible summer set up. 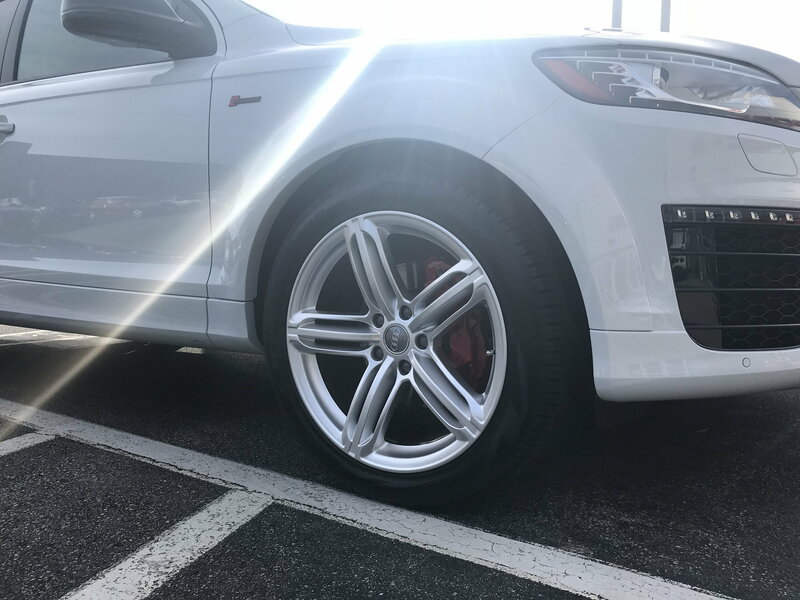 wheels look good, however your quattro script is not installed in the right spot and that SQ7 badge is bull crap.. so overall I give it a big thumbs down. That said, like a cleaner look so may remove the Quattro script all together. Audi made no SQ7 as I am sure you know in this gen Q7. Audi uses the S badge on its s line models from factory on door sills etc. and even the red block on the supercharge side badge and to ear mark the s line. Do u own an S line or base model? Given the above noted use of the S badging from Audi on the S line models combined with this q7 being a “sport edition” S line (+Audi doesn’t make a SQ7) felt comfortable adding the S badge with zero intention of trying to be another model released by Audi that doesn’t exit. Creating my own unique and different kind of Q7 with modifications. Swapped out all badging to blk and added the s badge. You sound like a “purist”a special breed of car guy. And who uses “bull crap” these days anyway. Last edited by Mickfluff; 11-08-2018 at 06:54 PM. 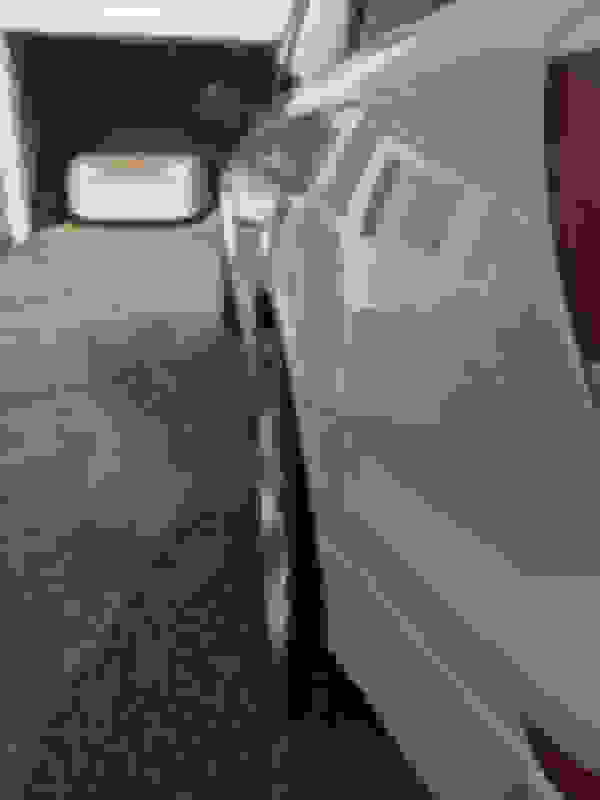 S-Line is not an S model, its hardly a "Sport Edition", its a base model with S model inspired styling only but none of the performance.. you got a "base" model just like my "prestige", Take the cosmetics like bumpers and badges off and the only thing you got on my fully optioned 'base' model is flappy paddles (21's were an option for a 'base' model)... an A6 w/S-Line package does does not make it an S6 however you try to reason it to your self.. A Q7 with S-Line package does not make that an SQ7 however you try to reason with your self. 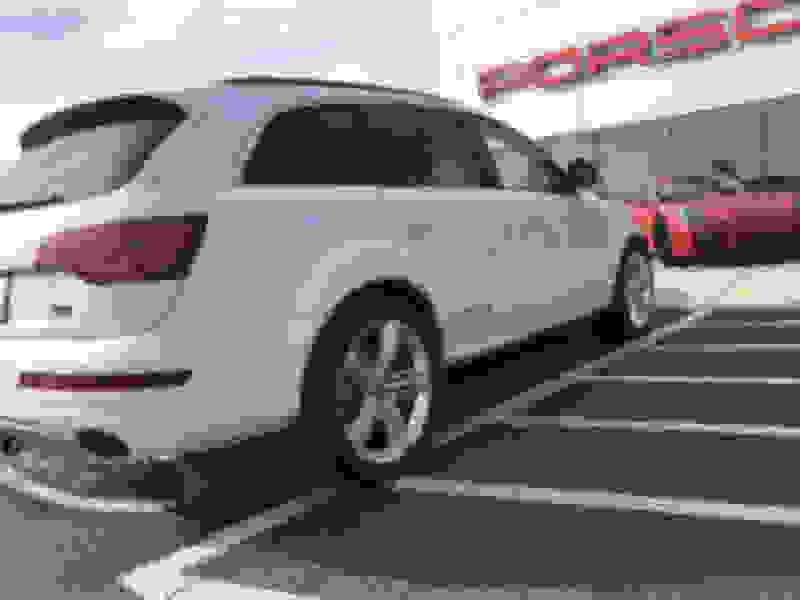 and we sorta did get an S model for this generation, it was badged W12 however and it looks nothing like your S-Line... mebe if you put out equal or greater power than an actual SQ7 you could rock it proudly as "your own replica" but its gonna take quite a bit more than an Apr Stage 2 tune to get you there, which you dont even have.. At best some dumb kid in a honda is gona think he crushed a 435hp SQ7 after he walks all over you, the only people who are going to recognize your badge are going to know your a poser right out the gate.. debadge and sticker bomb to your hearts extent, but dont put on fake badges.. pretending to have something you dont is just lame, most of us grew out of that in grade school.. 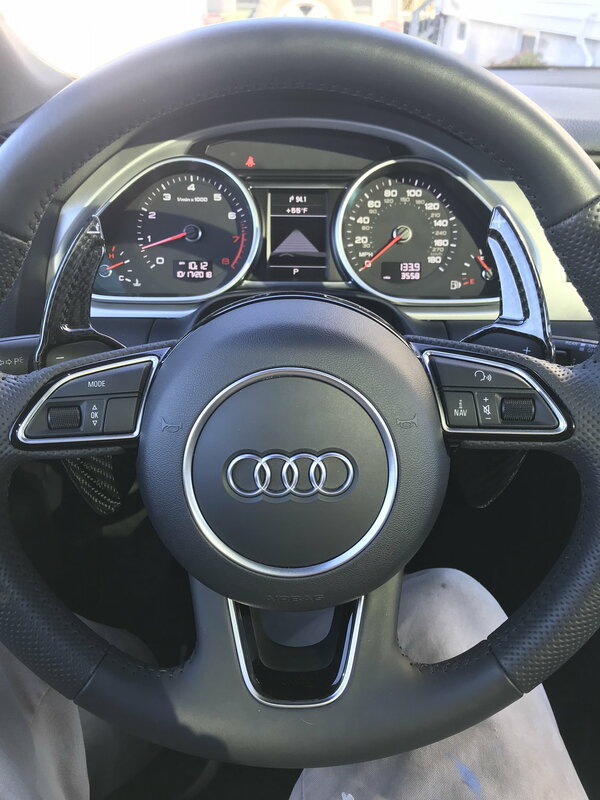 The A6 with RS6 badges that I see at my son's school dont deserve that badge no matter what he does to it, even though they never sold it here for his generation.. 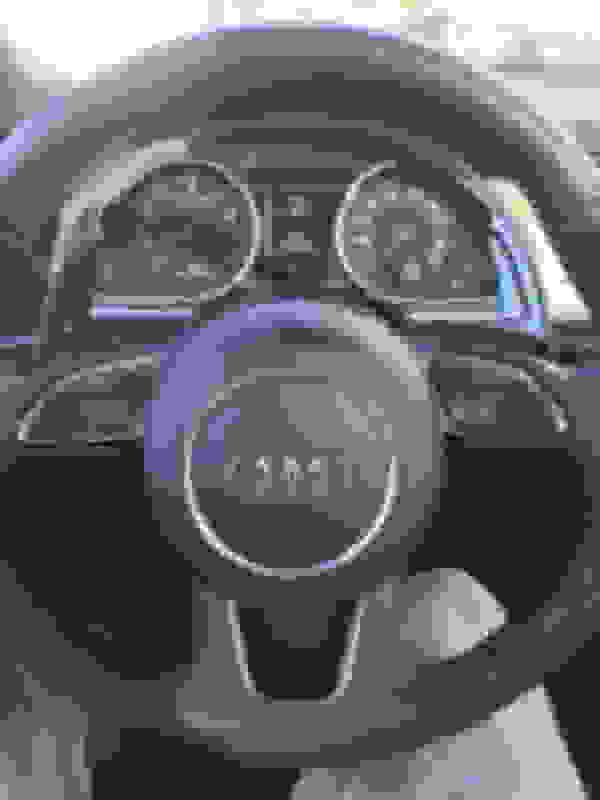 I had a real RS6, trying to claim that heap is anything close to that is a travesty. PS: **** **** ****, see forums limit expression options..
Last edited by dreadlocks; 11-08-2018 at 07:25 PM. you guys, the whole adding badges is very subjective. I'm very much of a keep what you got kind of person, but also abide by the live and let live...everyone has a right to express themselves and have no pretense to adding badges which aren't for the actual car. 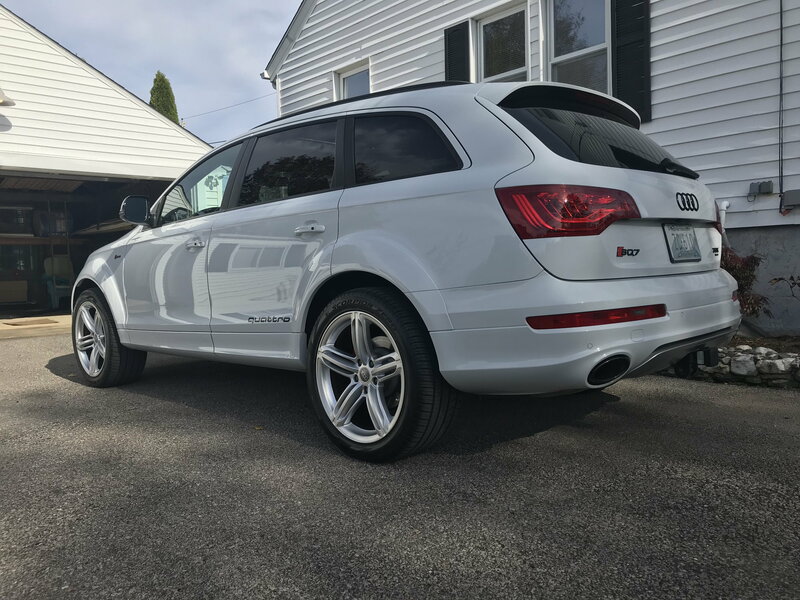 For example, my dad's Q5 3.0T, it had the TFSI badge on the back, since it's a Canadian vehicle, I ended up removing it and adding the 3.0T badge. Mick, I do like the look of the Sport Edition model, and especially like the creature comforts it comes with (air suspension, ACC, etc...), but adding the SQ7 is entirely your car, but anyone who knows Audi's will know what you have. I've seen a bunch of folks stick APR badges in the back of their tuned S4. We all enjoy modding our vehicles for our own tastes, dread, you like the off-road capabilities and modding to enhance that aspect of the vehicle. I personally enjoy enhancing the electronic/technical capabilities of our vehicles. Mick, looking forward to what you do next to your car. Sounds like a guy trying to justfity his base model q7? Simply asked the question as wasn’t sure how aware u were on the S-Line and the sport edition S-Line. Jeez Don’t be so insecure.....sure your base q is cute rolling on stockers gaining max miles per gallons possible. Ahahahahaha keep it stock for resale purposes. and no the w12 is NOT an s model ..... + never offered here in the states. plants so hardly the comparison. Badging a s line 6 as a s6 (a car that exists) would support your comments.... not the situation here. 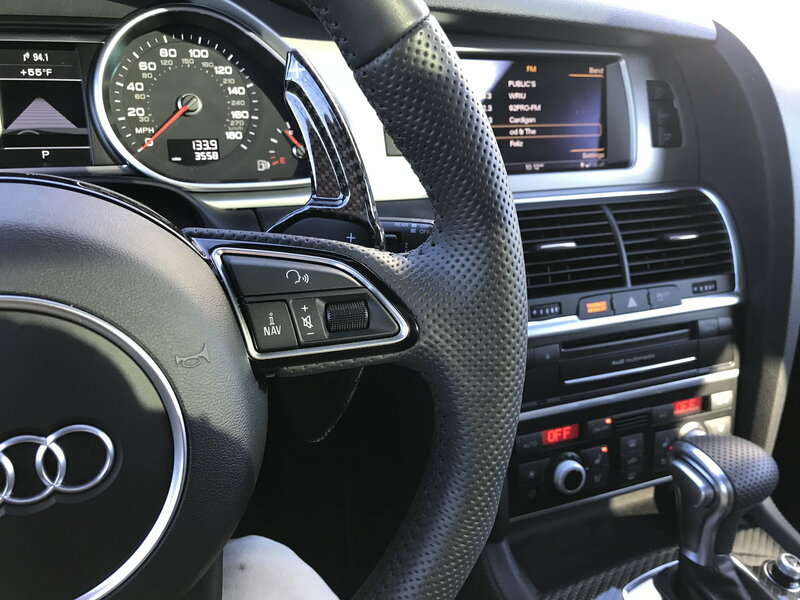 In this gen q7 there was no SQ7. New gen (ummm completely different vehicle) sure a SQ7 but not 2015 prior. So trying to be what? Posing a q7 model that never existed? How is that possible? Will be modding my q7 to my liking and you can keep rage replying. The truck sparks conversation with other true enthusiasts and would never present the truck for something it is not. Well use to track a tuned Honda S2000 (yes a Japan car) so yeah maybe a “ricer”. That car had a better gear box then cars I have owned costing 3X4 the price. the Quattro script was added not by me but by Audi....get your facts straight if going to try and be the authority on all things Q7. Plus Apr stage 2 pully, tune, exhaust, airbox I believe brings the q to within striking distance of the 500hp w12. (Minus the torque) so closer then u may think. Maybe u missed the link noting a “sport edition” s line model. Again take it up with Audi if your upset that this was created. See below. At this point feel like I should be charging you for the free Audi clinic and data. S-Line is not an S model, its hardly a "Sport Edition", its a base model with S model inspired styling only but none of the performance.. you got a "base" model just like my "prestige", Take the cosmetic front bumper and badges off and the only thing you got on my fully optioned 'base' model is flappy paddles and bigger wheels that I coulda optioned but didnt want... an A6 w/S-Line package does does not make it an S6 however you try to reason it to your self. and we sorta did get an S model for this generation, it was badged W12 however and it looks nothing like your S-Line... mebe if you put out equal or greater power than an actual SQ7 you could rock it proudly as "your own replica" but its gonna take quite a bit more than an Apr Stage 2 tune to get you there, which you dont even have.. the only people who are going to recognize your badge are going to know your a poser right out the gate.. debadge and sticker bomb to your hearts extent, but dont put on fake badges.. audi's dont deserve to be riced out. Last edited by Mickfluff; 11-08-2018 at 08:22 PM. I'm all for to each there own, do whatever you want.. im just calling your bull****.. you dont have a SQ7.. you sound like someone who wished they didnt have a base model Q7, I'm totally fine w/mine.. my badges say what I ride.. the only thing special about 'Sport Edition' is your black out package, which does look ****ing dope but does not deserve a special badge for, I know a Sport Edition when I see one.. but Ive got Air Suspension and Adaptive Cruise too, the S-Line styling was not to my liking.. I had the option to get an S-Line and declined, sporty trucks are not my thing and im not hating on your special edition base model.. just that dumb badge you put on the back for a vehicle that was never sold in the states and yours does not represent in any shape or form.. yeah they didnt make a 1st Gen SQ7, so what? That dont mean I can throw an R32 badge on a MK1 Golf because hey they are the same right and they didnt make an R32 in 1982 and I got these special parts on it and the fact that my vehicle has none of the parts or components, or performance, or even remotely close to the price tag of an R32, but yeah.. okay sure, sound logic. I play with badges all the time, I got a 3.0T badge on my 2001 Golf.. but I only put it on after I bored out the engine to 3.0L and slapped a big turbo on it.. I'll be putting a TDI badge on my Bus once that engine is in there.. You can do whatever you want with your car, and anyone who sees bull**** badges can call em out for it too.. welcome to the internet. Last edited by dreadlocks; 11-08-2018 at 09:00 PM. I Love your enthusiast "Make it your own" Mods just as I love Dreads! It is always interesting to see how people create! I personally wouldn't do it, because I like the no badge "clean" look, which was never me in the past! I would demote it as to "sleep" or be faster than noted! I like your flappies, they look great, but I rarely use mine, unless towing, which I find them super handy! All in all, I love the look of your Q! Clean and bright! And it only matters that you love it! I have been considering a tune, but in my case, it may just be wasting money, as I am not racing or moving houses or in an off road circuit! Mine fits my needs as is, stock, excepting the grill. I will be hunting a honeycomb grill, as my wife and I like the look much better!